Gerald Neil Henshaw6,7 [Jerry Henshaw8,9]. Born Jul 17 1930.6 Gerald and brother Joseph were twins. 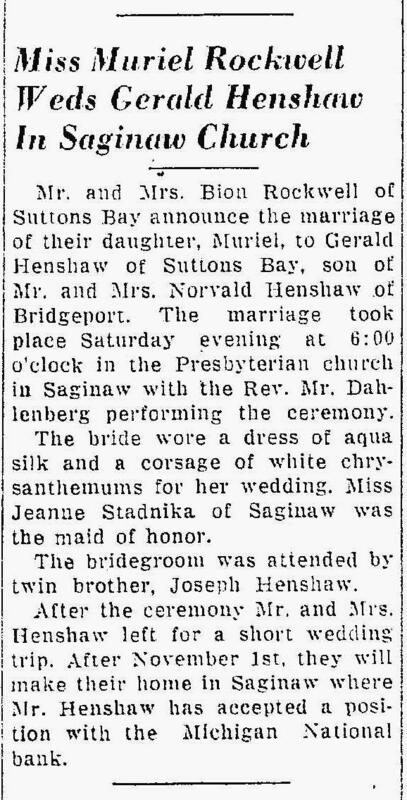 Gerald and Muriel's wedding was reported in the "Traverse City Record Eagle" (Traverse City, Michigan) on Monday, Oct 2, 195010 (see scan below). Christmas day guests of Mr. and Mrs. Jerry Henshaw were Mr. and Mrs. Norval Henshaw and son Joe of Saginaw; Mr. and Mrs. Bion Rockwell and son Chuck; P. C. Mork, and Mrs. Christine Setterho. The Henshaws returned to Saginaw on Thursday. Mrs. Norval Henshaw, accompanied by her husband, returned to their home in Saginaw after being guests of their son and daughter-in-law, Mr. and Mrs. Jerry Henshaw, since Memorial Day. Mr. and Mrs. Gerald Henshaw and daughter, Jan, will move this week-end into the Alfred Smith cottage on the bay, recently vacated by Mr. and Mrs. Rex Demorest, who have moved to Traverse City. Mrs. DeYoung of McBain was a guest of Mr. and Mrs. Jerry Henshaw Friday night. Mr. Henshaw is the grandson of Mrs. DeYoung. Mr. and Mrs. Jerry Henshaw and two children spent the weekend in Saginaw. Mr. and Mrs. Paul C. Mork and Mr. and Mrs. Gerald Henshaw returned Sunday from a three week's vacation in Florida. Mr. and Mrs. Jerry Henshaw were called to Saginaw, Sunday, by the death of a friend, Archie Neuschafer. They returned home Monday evening. Mr. and Mrs. Jerry Henshaw and daughter, Jan, spent the week-end in Saginaw and Centerline. They attended the wedding of Miss Delores Abed of Centerline and Paul Kolarek, manager of the Suttons Bay branch of the Traverse City State Bank. Joe Henshaw left Tuesday for his home in Saginaw after visiting the Jerry Henshaws the past week. Jan Henshaw, two-year-old daughter of the Jerry Henshaws is spending two weeks in Saginaw with her grandparents, the Norval Henshaws. Mr. and Mrs. Jerry Henshaw and children Jan and David spent the [..unclear..] in Saginaw with Mr. Henshaw's parents, the Jerry Henshaws. Jerry Henshaw spent the week-end in Saginaw. Mrs. Henshaw and children, Jan and David, who spent the week with the Norvald Henshaws accompanied him home. Mr. and Mrs. Gerald Henshaw spent the weekend in Ann Arbor and Saginaw. In Ann Arbor they visited Norval Henshaw, who is ill at University hospital. Jerry Henshaw, accompanied by his uncle, Oliver Hanson of Kewadia, spent Sunday in Ann Arbor visiting Norval Henshaw, a patient at University hospital. Mr. and Mrs. Bion Rockwell accompanied by Mrs. Jerry Henshaw left Tuesday for Detroit, where they will spend two days. Oliver Hansen spent the week-end with relatives at Mt. Pleasant and Detroit, going and returning with Gerry Henshaw of Suttons Bay. Oliver Hanson was dismissed Friday from Munson hospital where he underwent treatment. Mr. and Mrs. Bion Rockwell and Mrs. Gerald Henshaw attended the wedding reception of Miss Joan Rockwell and Mr. Gerald L. Richardson, which was held on Saturday afternoon in the Community hall in Benzonia. Miss Rockwell is a niece of Bion Rockwell. Norval Henshaw of Ann Arbor is a guest at the home of his son and daughter-in-law, Mr. and Mrs. Jerry Henshaw. Mr. and Mrs. Paul Mork left Friday from Ludington to spend a week in Milwaukee with Mr. and Mrs. Roy Warren. They were accompanied to Ludington by Gerald Henshaw, who returned the same day. Mr. and Mrs. Gerald Henshaw have named their infant son born May 26th at Munson hospital, Kenneth Allen. Mrs. Henshaw and infant son returned to their home Saturday. Gerald Henshaw left Sunday for Ann Arbor where he will take a banking course at the University of Michigan. IS NAMED MANAGER -- Gerald Henshaw of Suttons Bay has been named as acting manager of the Suttons Bay branch, Traverse City State bank, succeeding Paul Kolarik, who has been transferred here to the State bank. Serving on the staff of the State bank at Suttons Bay from 1947 to 1950, Mr. Henshaw was at the Michigan National bank in Saginaw from 1950 to 1951, when he returned to the Traverse City State bank. Mrs. Carol Henshaw returned Sunday to her home in Bridgeport after a visit of four days with Mr. and Mrs. Gerald Henshaw and family. Mr. and Mrs. Gerald Henshaw and children Jan and David, were called to Saginaw Thursday due to the illness of Mr. Henshaw's mother, Mrs. Carol Henshaw. Mrs. Henshaw and children remained in the city. Mr. Henshaw drove to Saginaw Sunday accompanied by his son, Kenneth, and Jan Bonek. Gerald Henshaw drove to Saginaw on Monday to bring Mrs. Henshaw and children, Jan, David and Kenneth, home. Mrs. Henshaw has been caring for her mother-in-law, Mrs. Carol Henshaw, who is ill, for the past two weeks. Jan Henshaw, daughter of the Gerald Henshaws, celebrated her fourth birthday on Thursday. He grandmother, Mrs. Carol Henshaw of Bridgeport arrived Friday to spend the weekend. Mrs. G. Henshaw's first year cooking group entertained their mothers at a breakfast Saturday morning at the home of their leader, Mrs. Henshaw. Mrs. Carol Henshaw and son Joe of Bridgeport arrived Saturday for a visit at the Gerald Henshaw home. Gerald Henshaw left Sunday for Ann Arbor where he is taking a course in banking at the University of Michigan. Gerald Henshaw returned Sunday from Ann Arbor where he spent two weeks attending the University of Michigan. Mrs. Carol Henshaw of Bridgeport arrived Saturday to spend a few weeks with the Gerald Henshaws. Mr. and Mrs. Bion Rockwell of Olivet and Charles Rockwell of East Lansing spent Thanksgiving weekend with Mr. and Mrs. Gerald Henshaw. Mrs. Henshaw and four children accompanied her parents, the Rockwells, to Olivet, where she will spend two weeks. Mr. and Mrs. Bion Rockwell of Olivet are spending their spring vacation with their son-in-law and daughter, the Gerald Henshaws. SUTTONS BAY -- Marie Carol Henshaw, 65, of Suttons Bay, died Wednesday, Aug. 30, 2006, at Munson Medical Center. Marie was born in Traverse City on July 9, 1941, the daughter of Clifford and Alice (Link) Campbell. On Nov. 23, 1967, in Traverse City, she married Gerald Neil Henshaw. Marie was a pillar of the Suttons Bay community. She absolutely loved the people of the area and its tight-knit, small-town values. Marie had an amazing and vast group of friends whom she treasured dearly. Marie was an excellent seamstress who loved quilting and spending time in the garden during her leisure time. Most importantly, she will be remembered by all as a mother who dearly loved her family, and as a grandmother who dearly loved her grandchildren. Marie's loved ones will forever remember her very positive outlook on life and her keen sense of humor. Marie is survived by her five children; Pamela Henshaw of Kalamazoo, David Henshaw of Kalamazoo, Jennifer (Paul) Richards of Battle Creek, Janne Henshaw of Nashville, Tenn. and Jeff (Sue) Henshaw of Kalamazoo; her mother Alice Campbell of Traverse City; her beloved niece and nephew, Ann Marie Sparks and Victor Lynn Bliss; seven grandchildren and one great grandchild. She was preceded in death by her husband on March 26, 2001; her father; a son, Kenneth; two brothers, Jerry and Tony Campbell; and a sister, Sandra Bliss. A gathering will be held Friday, Sept. 1, from 6 to 8 p.m. at the Martinson Funeral Home of Suttons Bay. The funeral service will be held Saturday, Sept. 2, at 11 a.m. at Keswick United Methodist Church of Suttons Bay. A private family burial will be held at a later date. The Rev. Donald Spachman will officiate. Memorial contributions may be directed to Suttons Bay "" [sic] Bingham Fire and Rescue, P.O. Box 280, Suttons Bay, MI 49682. Arrangements are with the Martinson Funeral Home of Suttons Bay. The "Traverse City Record Eagle", Jun 13 1953; http://www.ancestry.com. The "Traverse City Record Eagle", Apr 30 1955; http://www.ancestry.com. The "Traverse City Record Eagle", May 27 1954; http://www.ancestry.com. Contribution from Brenda Hansen McKenna (). The "Traverse City Record Eagle", Dec 28 1951; http://www.ancestry.com. The "Traverse City Record Eagle", Jun 28 1952; http://www.ancestry.com. "Traverse City Record Eagle" (Traverse City, Michigan), Oct 2 1950; http://www.ancestry.com. The "Traverse City Record Eagle", Dec 3 1955; http://www.ancestry.com. The "Traverse City Record Eagle", Sep 27 1952; http://www.ancestry.com. The "Traverse City Record Eagle", Oct 25 1952; http://www.ancestry.com. The "Traverse City Record Eagle", Jan 17 1953; http://www.ancestry.com. The "Traverse City Record Eagle", Mar 7 1953; http://www.ancestry.com. The "Traverse City Record Eagle", Apr 11 1953; http://www.ancestry.com. The "Traverse City Record Eagle", May 23 1953; http://www.ancestry.com. The "Traverse City Record Eagle", Jul 11 1953; http://www.ancestry.com. The "Traverse City Record Eagle", Jul 25 1953; http://www.ancestry.com. The "Traverse City Record Eagle", Oct 24 1953; http://www.ancestry.com. The "Traverse City Record Eagle", Dec 19 1953; http://www.ancestry.com. The "Traverse City Record Eagle", Jan 25 1954; http://www.ancestry.com. The "Traverse City Record Eagle", Feb 6 1954; http://www.ancestry.com. The "Traverse City Record Eagle", Apr 10 1954; http://www.ancestry.com. The "Traverse City Record Eagle", Jun 5 1954; http://www.ancestry.com. The "Traverse City Record Eagle", Jun 26 1954; http://www.ancestry.com. The "Traverse City Record Eagle", Feb 7 1955; http://www.ancestry.com. The "Traverse City Record Eagle", Apr 1 1955; http://www.ancestry.com. The "Traverse City Record Eagle", Apr 9 1955; http://www.ancestry.com. The "Traverse City Record Eagle", Jul 9 1955; http://www.ancestry.com. The "Traverse City Record Eagle", Jul 23 1955; http://www.ancestry.com. The "Traverse City Record Eagle", Jul 30 1955; http://www.ancestry.com. The "Traverse City Record Eagle", Mar 30 1956; http://www.ancestry.com.